Jacksonville Restaurant Reviews: Home > Food Trucks > It’s A Holiday Food Truck Takeover! Shop local, eat local, be local this weekend with the Hemming Park Holiday Market and Food Truck Takeover! There will be 20+ local vendors and 12 of Jacksonville’s best food trucks ready to help you kick off the holiday season with a whole lot of fun! Live music, free pictures with Santa, delicious food, and more await! The event is happening Saturday, December 8th from 11-5pm at Hemming Park! Come enjoy a fantastic day downtown and support the businesses that make Jax unique! You can RSVP to the event HERE! The Happy Grilled Cheese: ​Multiple time People’s Choice Winner for best food truck in all four major Jacksonville publications, The Happy Grilled Cheese is one of Jacksonville’s OG heavy hitters! Take it cheesy with their signature Daddy of the Mac and loaded cheese fries. Plus, Pro Tip: you can add mac and cheese to any sandwich if you’re feeling decadent! Our favorite is to add it to the California melt! 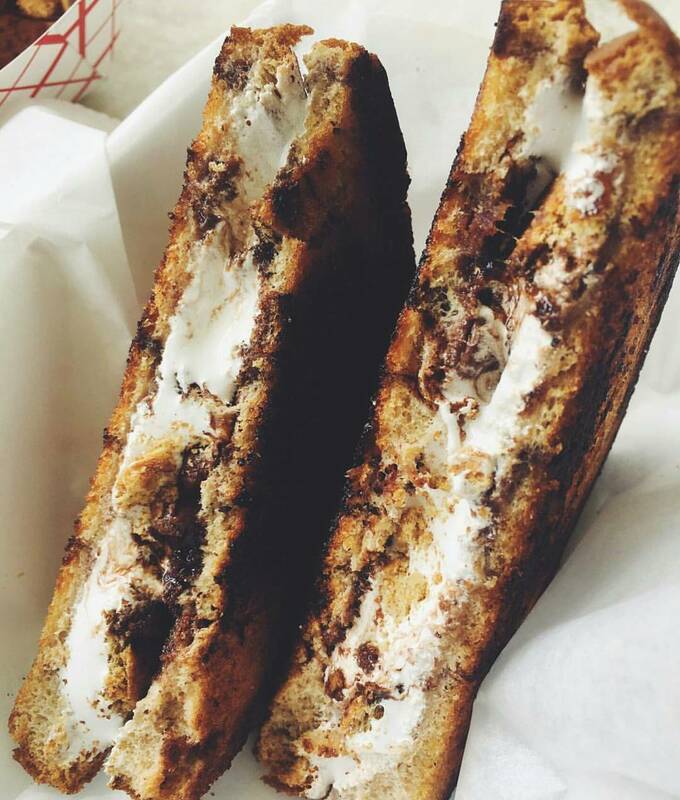 You’re also not going to want to miss their sweet, decadent, chocolate laden S’more melt! Team Love Seafood:​ Get your souls ready for this amazing Southern style truck! Specializing in all things comfort food, Team Love Seafood serves up fresh fried or grilled fish, shrimp, fried pickles, hush puppies, gumbo, etouffee and more! They’ve got the flavors of the South on lock, so come out and try the most flavorful fried seafood this side of the Mississippi! Whether you go poboy, deep fried deviled eggs, or pound cake cookies for dessert — you won’t be disappointed! 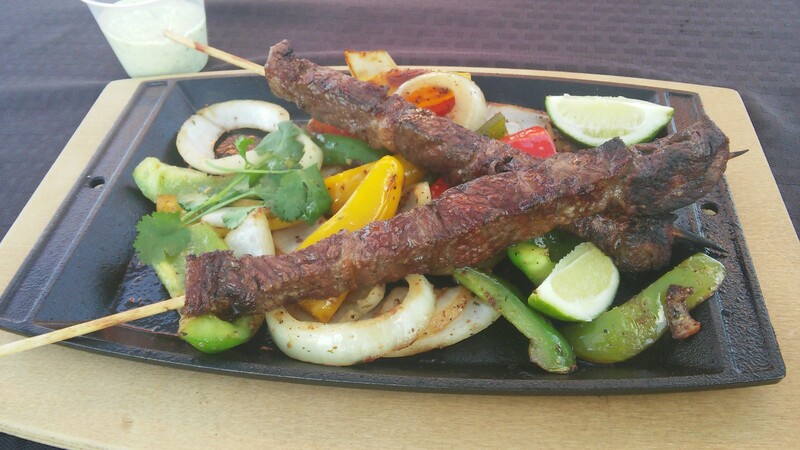 Delish Kebabs:​ You’ll smell these amazing grilled kebabs before you get to the truck! Serving up authentic and award winning Brazilian charcoal grilled kebabs, Delish Kebabs is taking simple food and making it extraordinary. Their bacon wrapped chicken was the winner of the 2014 Food Truck Wars! Don’t miss their yuca fries either. Also, the garlic sauce. OMG the garlic sauce! They’re an official food vendor for the Orlando City Soccer Club, and have competed and won in statewide food truck competitions time and time again! Blazin Azn will be serving it up at the Food Truck Takeover and Holiday Market next Saturday! Bacon fried rice is all we really need to say, but there is SO much more to love at Blazin Azn. Spring rolls, egg rolls, and incredibly tender teriyaki shrimp and chicken are all worth ordering. Want a real treat? 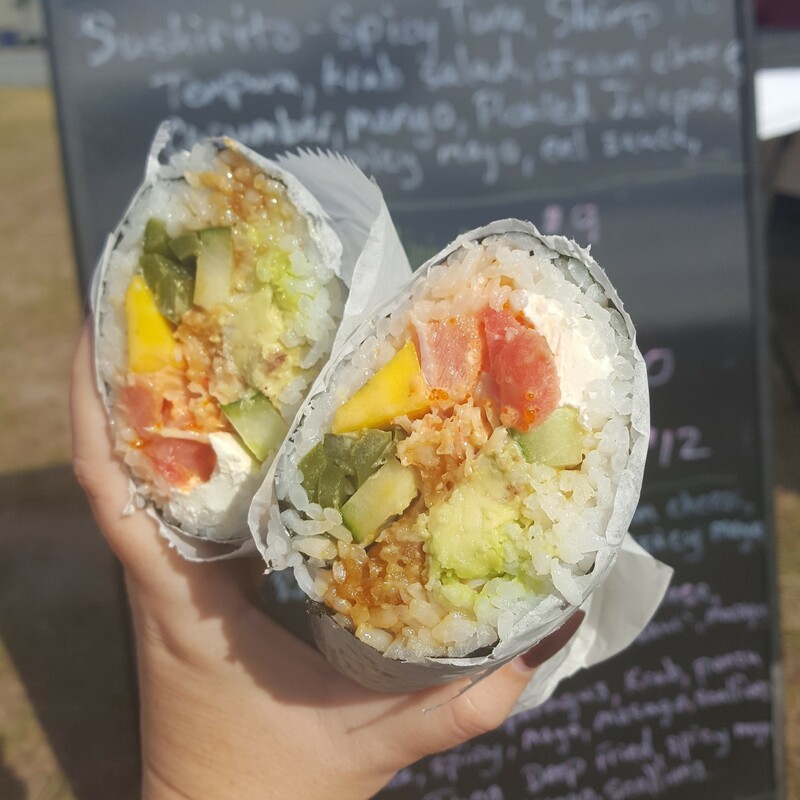 Enjoy the only sushi or sushirito coming off a food truck in Jax with plenty of signature rolls! Chef Gus loves to surprise us with over the top rally specials too, including his multi award winning Tuna Tataco! There’s a fusion of flavors at Blazin Azn so we have faith there is something that everyone will enjoy! Front Porch Kettle Corn: Start your food truck rally adventure here for an appetizer! Fresh made sweet and savory popcorn, mouth watering spicy pork rinds, and the best southern sweet tea south of the Mason-Dixon line. Made with a secret recipe and very special water, this tea is unparalleled! Take home a few popcorn and pork rind containers to snack on later – you will thank us! There was a reason this popcorn was the featured snack of Jacksonville baseball for several years running–it’s amazing! Jammas Jax: One of the newest additions to the Jax food truck scene, Jammas is new business of Chef Julio Gonzales who began fan favorite El Mariachi Loko. He’s delved into Asian cuisine now with amazing chicken satay, freshly prepared noodles and rice in his wok you can watch him cook on in the truck window, and flavorful egg rolls and ribs. We love his pad thai, and what better to warm you up in chilly December weather than curry? This is a truck you won’t want to miss. Manny’s Cuban Food Truck: Is there any food more comforting than authentic Cuban cuisine and melty Cuban sandwiches? Manny’s brings bold flavors and gourmet flair to traditional favorites. Using their long time family recipes, they’re serving up fresh Cuban plates and sandwiches and hot Cuban coffee with a kick! Their Cuban coffee and picadillo are can’t miss items in our opinion, but anything you choose you will love! Nitrogen Creamery: ​Do you think ice cream is the best dessert in the world? You’ll love it even more made with nitrogen! This is Jacksonville’s first and ONLY liquid nitrogen ice cream truck, and they’ve set a standard that’s hard to beat! Winner of Food Truck Wars Most Delectable Dessert in 2016 and a stack of awards for this key lime ice cream pie since then, this truck is sure to blow you away. All flavors are homemade daily using -320 degree nitrogen and made from only four ingredients! They also have fruit smoothies, hot donut holes, and the best milkshakes in town. The use of the nitrogen brings out the true flavors of each ice cream and make it quite a decadent treat. Alma Food Truck: Taco, burrito, or bowl — you choose your way at Alma! A hybrid of Mexican and Asian favorites, Alma is making some of the freshest food around! Whether you’re feeling pork belly, adobo chicken, shrimp, or tofu, they’ve got variety for days. Their menu is also seasonal, so you can guarantee you’ll get something creative and new every visit. They’re famous for their ramen burrito, and also have some awesome vegetarian and vegan options as well! One of the most popular Mexican trucks in Jacksonville, Chubby Burrito, specializes in authentic Mexican style street food. All food is freshly prepared daily and focuses on simple, authentic flavors. The carne asada street tacos and chicken tinga burritos are can’t miss orders. Oh, and did we mention there are churros?! Multiple time winner of Best Global Tacos, Chubby Burrito satisfies your need for all your Mexican comfort food favorites. Mama’s Food: Argentinian comfort just like Mama makes! Huge stuffed empanadas and steak quesadillas are our go to orders from this Jax original, but their rice bowls are a massive craveable meal too! We’d drench everything with their homemade chimi mayo if we could. This experienced truck has traveled all over Florida to festivals and has created dedicated fans wherever they go! Want to stay apprised on future food truck happenings ? Follow our sister brand on Instagram at @findjaxfoodtrucks ! Tagged american, Family Friendly, Food Truck, Food Truck Rally, Latin American, mexican, outdoor dining, seafood. Bookmark the permalink.